As higher education professionals, it’s imperative that we provide our students with a valuable, empowering student experience. More often than not, that means finding ways to communicate with them in relevant ways at each point along the student lifecycle. Join the Guidebook EDU team for a roundtable conversation as they discuss how mobile technology can (and is!) 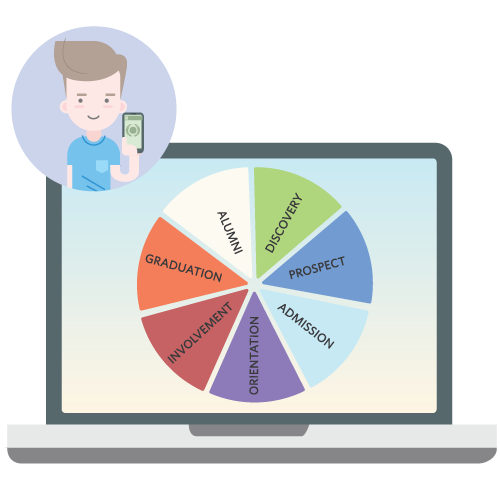 impacting student experience, ways to stay relevant in your ever-evolving communication strategy, and actionable tips for impacting specific inflection points along the student lifecycle with mobile communication. Higher Education scholar Dr. Paul Gordon Brown joins us for a discussion on the state of digitalization in higher ed today. In the face of an ever-evolving technological landscape, Student Affairs professionals face the need to keep up with trends and ensure seamless communication with students. Paul and Guidebook's Chris Trudell discuss trends we're seeing in higher ed today and propose their thoughts on how Student Affairs professionals can keep up. Jim is the East Regional Manager of Guidebook EDU. Prior to Guidebook, Jim held positions in student activities, university unions, and alumni relations at Tier 1 institutions in the southeast. Paul is a speaker, consultant and educator on a wide variety of topics impacting colleges and universities and their students. Since a young age, he has been fascinated by technology. From what was once a hobby, Paul has cultivated a passion for and conducted his doctoral research on digital technology’s impact on higher education and its students. Chris is a member of the GuidebookEDU team and the former Associate Director of New Student and Family Programs at Clemson University. He has presented extensively with NODA about issues relating to digital student experiences and the orientation, transition, and retention model. You may have met him at a trade show, or remember him from some of our previous webinars!